This is an unfinished project that tries to improve upon the Kodak 3A panoramic. Once I got the 3A working well enough to take actual pictures I discovered a few things. Firstly that I really liked the 6×14 format and that my old 90 Angulon did a very reasonable job. Secondly that the 3A was fiddly to set up and use and I kept winding on the wrong amount or forgetting to wind on. I started thinking about maybe getting a better winding mechanism and maybe making a camera that was a little more compact and less fiddly. 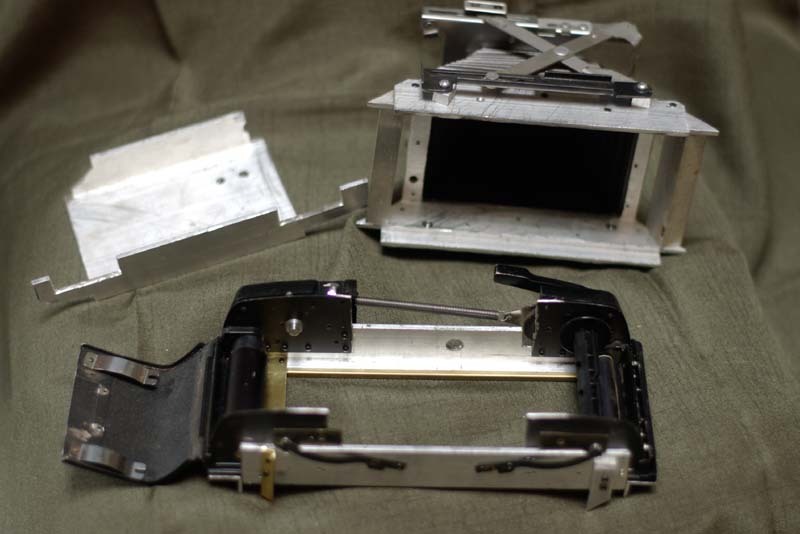 The obvious idea was to take a 6×7 camera and stretch it so that winding on two 6×7 frames gave you one 6×14 frame. 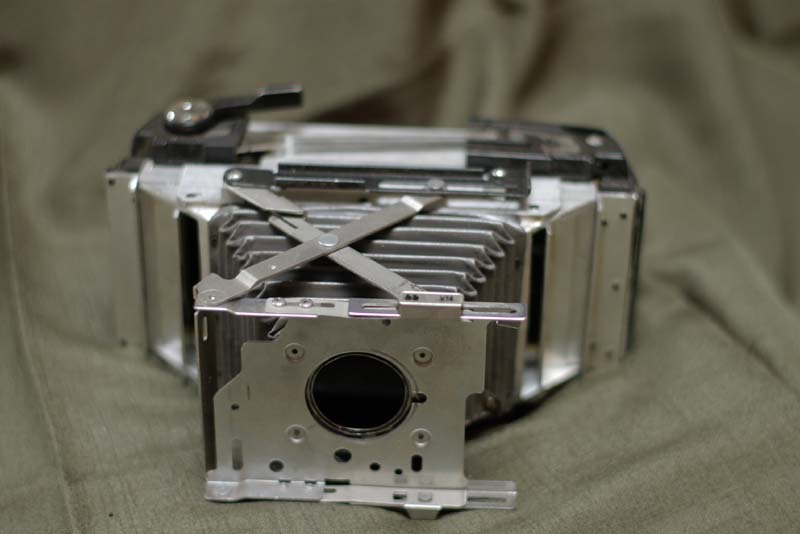 I have a couple of Pentax 6x7s but they are way too complex for that sort of modification and in any case winder failure is the main cause of death for them, so there is little prospect of getting a parts camera that would be any use. I then looked at the Graflex roll film backs which led me to the Mamiya RB67 back which is a more modern precison version. The intended lens is the old faithful 90 Angulon although I have looked at making it compatible with the Speed Graphic lens board so that I can try different lenses. 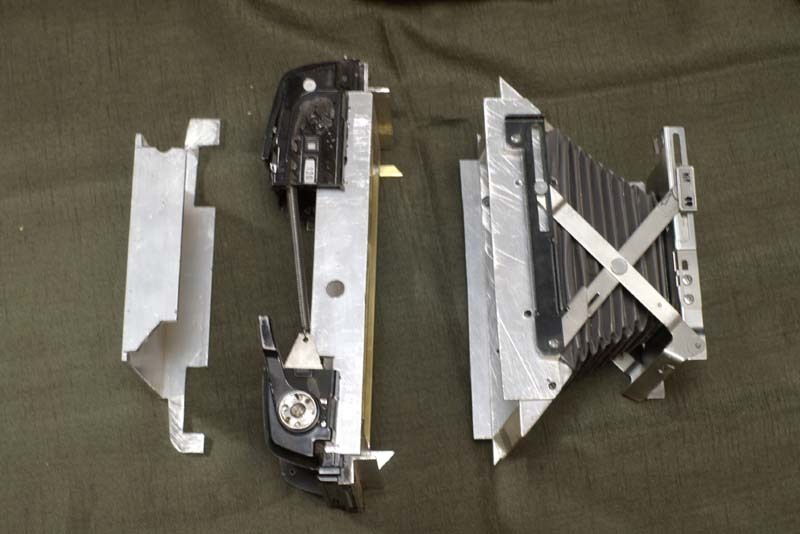 The RB67 film holder was cut in half and then screwed to a body made from scraps of 80mm x 25mm aluminium channel. In the picture above you can see the bisected RB67 back and the pieces of channel used to join it. The spring running across the top keeps tension on the interlock that stops you winding on past the end of the frame. The bellows was scavenged from a Polaroid J66 which isn’t really wide enough for 6×14 so it is attached to yet another piece of aluminium channel to move it far enough from the film plane to prevent vignettting. The three holes in the back and larger hole on the top serve no purpose, they’re just the result of using scraps of alloy lying around the workshop rather than buying new peices. Here it is split into the three parts. 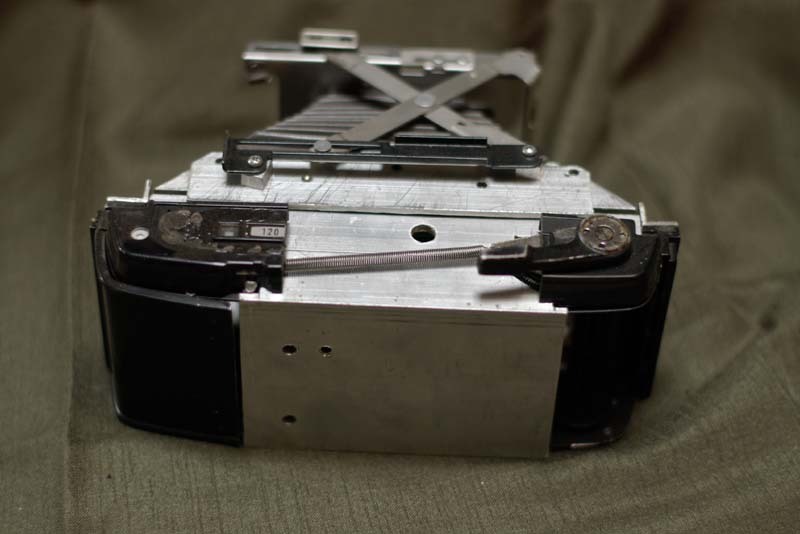 The RB67 magazine was taken apart, cut in half and then screwed to the inside of the channel. This is *almost* the right size but is actually 1 – 2mm too wide. In retrospect I should have made a full length shim on the bottom of the channel to make it an exact fit. What has happened is that some pieces aren’t quite square, including one of the rollers. It still looks like it will work, but not as well as I had planned. This shot gives a good idea of how it all goes together. I’m yet to decide whether to permanantly attach the front part to the body as it will make film loading more difficult. Actually, the chances are that I will abandon this version. I have bought another couple of RB67 magazines, a 120 and a 220, and will investigate stretching those and then build a camera to suit.